Cook up a storm with The Shopping Channel! 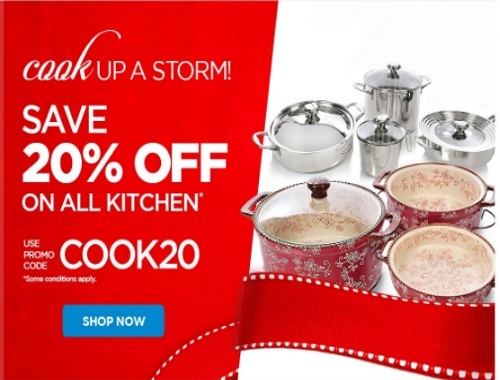 Save 20% off all kitchen items with the promo code below! Enter the promo code COOK20 at checkout. Some exclusions apply. Offer is valid October 24 2016 from 10pm ET to October 27 2016 9:59pm ET. Promo code cannot be redeemed on Dyson, KitchenAid, Vitamix, Pink Tartan or Ron White merchandise, Electronics, Electronic Accessories, Coins & Banknotes, Gift Cards, Auto Delivery items, our Today's Showstopper offer, Encore Today's Showstopper offer or Exclusive For You Today's Showstopper Presale offer, or redeemed for cash, or used towards payment of the TSC Credit Card.